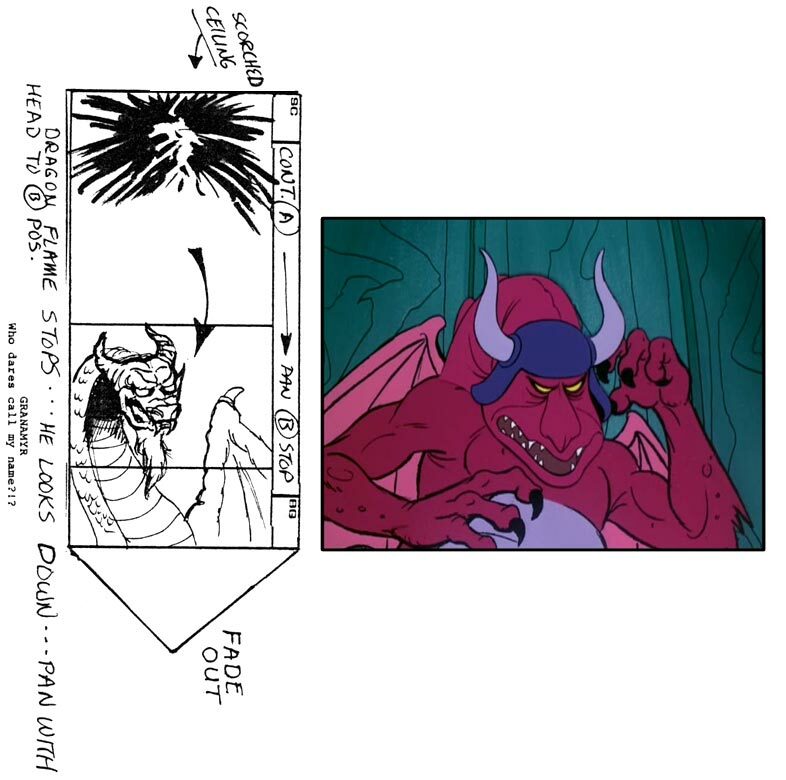 "The Dragon's Gift" was the first storyboard I did when I was rehired in March of 1983 for the first season of He-Man and the Masters of the Universe. It also was the first of several scripts by Larry DiTillio that I had the pleasure to board. 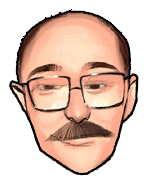 Larry became my favorite He-Man writer and I asked for his scripts whenever I had a choice. Larry loaded "The Dragon's Gift" with lots of good stuff: mirth, ancient magic, a Skeletor and Teela swordfight, the palace library, a map of Eternia, ice trolls, ice hackers, a treeprachaun, Skytree, and, best of all, Granamyr. The story starts out in the throne room of the Royal Palace. Prince Adam is late as usual because of Cringer's laziness. But when enticed by a Royal Fish Fry, Cringer bowls over Prince Adam. They tumble into the throne room landing in a heap on the floor. My staging of the heap was revised for obvious reasons. Man-At-Arms rushes to grab the gift (the Weird of Crystal) before Randor can touch it and is instantly turned to crystal. While Adam and Cringer slip out to change, Teela grabs a sword from the wall and attacks Skeletor. I called for new animation based on Teela stock and Zorro stock to play out the swordfight. The animators did a fine adaptation and the action works quite well. Skeletor pushes Teela to the floor where a few scenes later she trips Skeletor. I am particular pleased with the final shot of the pan from Skeletor down to Teela on the floor. Teela's pose is a difficult angle but the layout artist got it perfect! "The Dragon's Gift" has a theme of honoring one's word running through it. 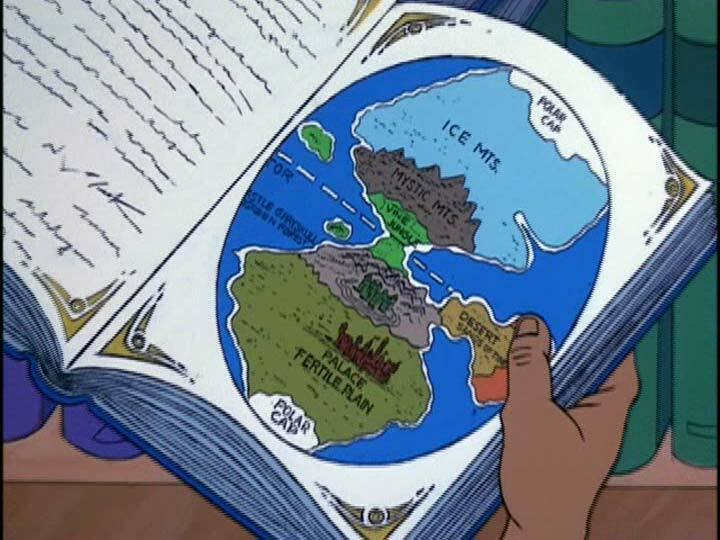 The first instance is the pact between the Great Dragons and Castle Grayskull. The Sorceress knows who might be able to undo the crystal spell but will not reveal the location of Granamyr's lair because of her promise. 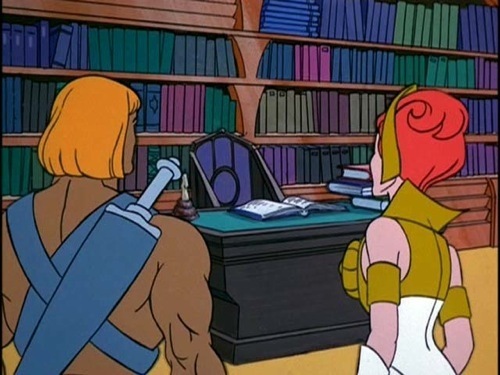 However, she does send He-Man and Teela to visit their local library, a nice touch. Larry DiTillio loves dragons. 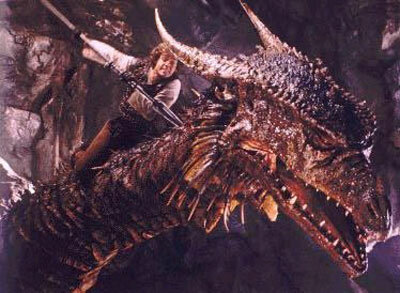 I love dragons. Who doesn't love dragons? So He-Man and Teela seek out the last of the ancient dragons deep in the frozen peaks of the Ice Mountains. 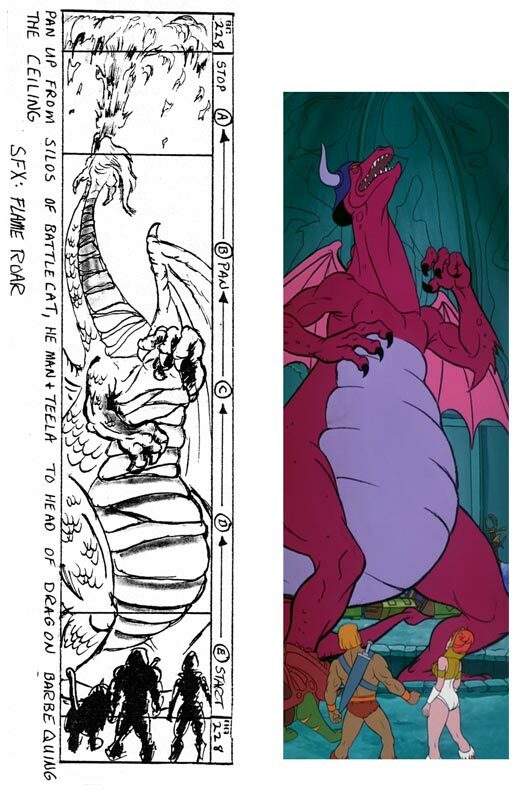 When He-Man calls out Granamyr's name, the dragon rises from a pit in the center of his domed lair. The camera pans up from He-Man and Teela to the ceiling revealing the dragon's great size. I don't remember if the script had Granamyr torching the dome or if that was my idea. Either way, the director decided it was one effect too many and ditched the flames. Then Granamyr looks down and says "Who dares call my name?!?" At least, that is what the script called for, but the line is missing from the finished scene. Dialogue is commonly cut for time or cost, but in this case, the speech is animated. Very curious – Granamyr's mouth moves but there's no voice. As you can see my Granamyr looks a little different from the final animation. 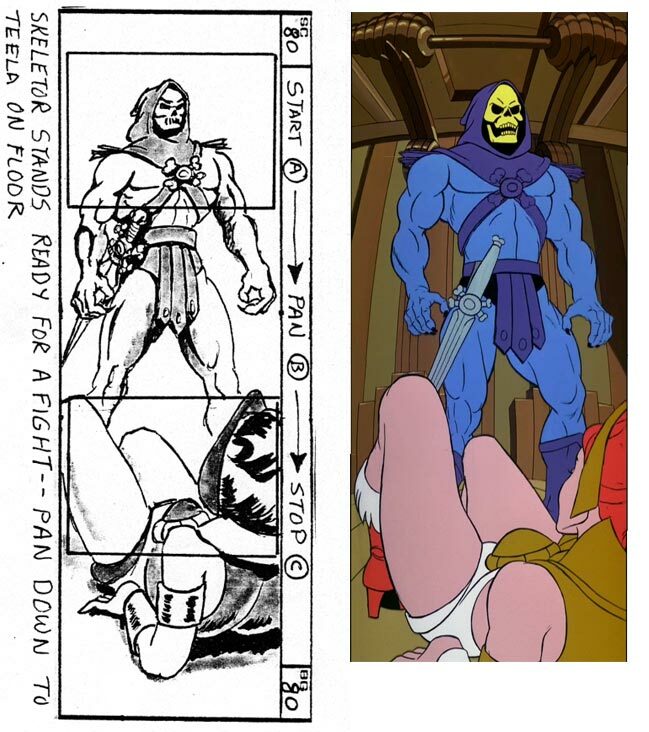 During the production of He-Man it was common for the storyboard to be started before character models were approved. I based my dragon design on various illustrations I had seen but the main inspiration came from the 1981 film, "Dragonslayer." Larry's description of the old dragon included a beard which I put in my board drawings. I did not like the final character design, especially the helmet. So, in my passive/aggressive way, I stubbornly continued to draw my version of Granamyr, even in the sequel, "The Return of Granamyr." The second instance of a promise is to bring Granamyr a gift, namely Skytree, or be sent to the Realm of Demons forever. He-Man agrees to the deal to save Man-At-Arms. However, when faced with a talking, living Skytree, He-Man can't chop him down, even for a friend's life. Teela is naturally upset but understands. The third instance of honoring a bargain comes when our heroes return to Granamyr empty-handed and accept the terms of the agreement. Granamyr is impressed with He-Man's integrity and gives him ... wait for it ... a book of knowledge. Okay, there are two themes: honoring one's word and books. Back at the palace, Man-At-Arms is once again his flesh and blood self having a good laugh with Teela, Adam and a sour Cringer. The animation of this common ending was very well staged and animated. So I include it here to close this episode.